For those of you unfamiliar with Carlos Santos, it is a Portuguese Brand founded in 1942 in São João da Madeira. The name was adopted a few decades later and is now a family business ran by Carlos & Ana Santos. They operate a state of the art factory in North Portugal producing handmade shoes of great quality with the Goodyear Welted System. The area is a Shoemaking hub for Portugal, just like Northamptonshire in England. Not only they make their own shoes, but they also craft shoes for other companies, such as Herring. 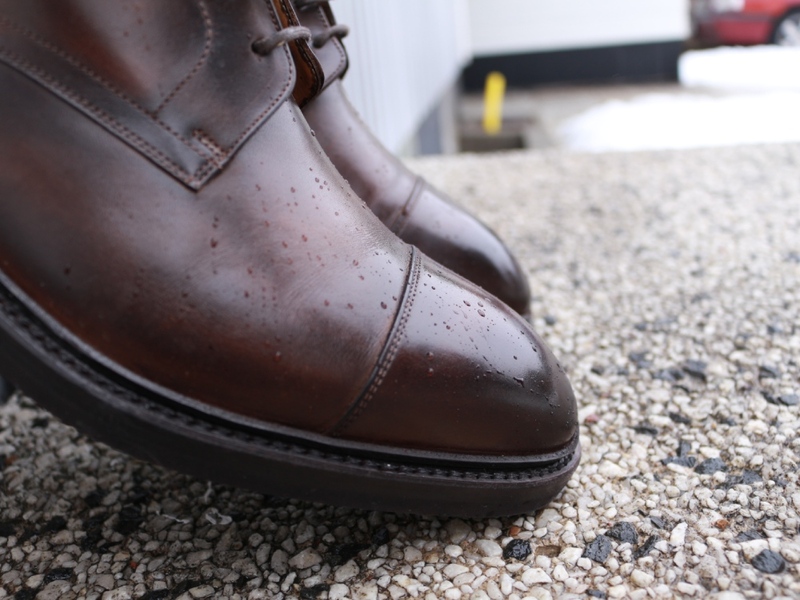 There is also a customised Patina Service where you choose from various models and lasts and personalise your shoe. 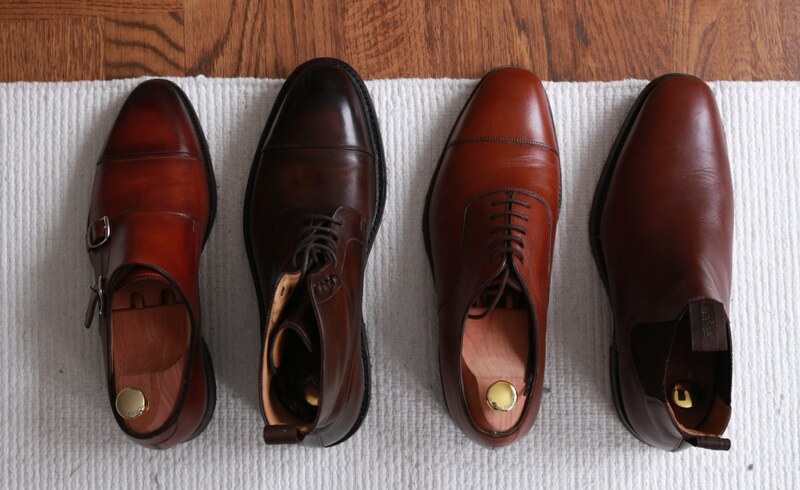 The result is really staggering and I urge you to check out my Wine Shadow Monk-Straps Review. What I find extremely interesting is that each Patina Colour bears the name of a town in Portugal. As a piece of trivia, Coimbra is a town in Central Portugal known for its student festivals. Lastly, there is a “Handgrade” line that pops up in very limited editions and is absolutely stunning. Especially the Adelaide models are of the highest quality and as good as (if not better) than much more expensive Brands. As for availability, Carlos Santos Shoes are quite easy to find in Europe these days but maybe a little harder in other continents. Pro Tip: The Boot comes in many different colours, including the incredibly beautiful Norte Blue but also in Pebble Grain. From time to time you can find some limited edition models with Suede or even Tweed. Prices for the regular Boot seem to be a little lower through retailers. My package arrived through TNT and was delivered to my work. It was neatly packed in two protective layers and inside was the classic Carlos Santos Box. Just like last time, a dark black box with the Carlos Santos Goodyear Welted Logo although a little bigger this time to accommodate for the Boot’s larger size. On the side you will find some quick facts such as the last, style reference, sizing and leather. But it is inside that the magic happens. Two of my colleagues were watching me unwrap this at work with curiosity. “These are some really nice Boots. By the way, you are smiling like a kid on Christmas”, said David. As soon as I opened the box, I was greeted by the two dark dust bags. Underneath, a beautiful Dark Brown Boot was neatly placed, separated by the other with a layer of protective foam and thin paper. There was also the standard little leaflet that explains the Goodyear Welt System and a plastic shoe horn. The latter is an extremely nice touch and gets the job done. Pro Tip: Please, remember to always use shoe trees and shoehorns! It will prolong the life of your shoe a lot! First impressions do matter and not let anyone else tell you otherwise. They set the pace and build up the excitement for what there is to come. 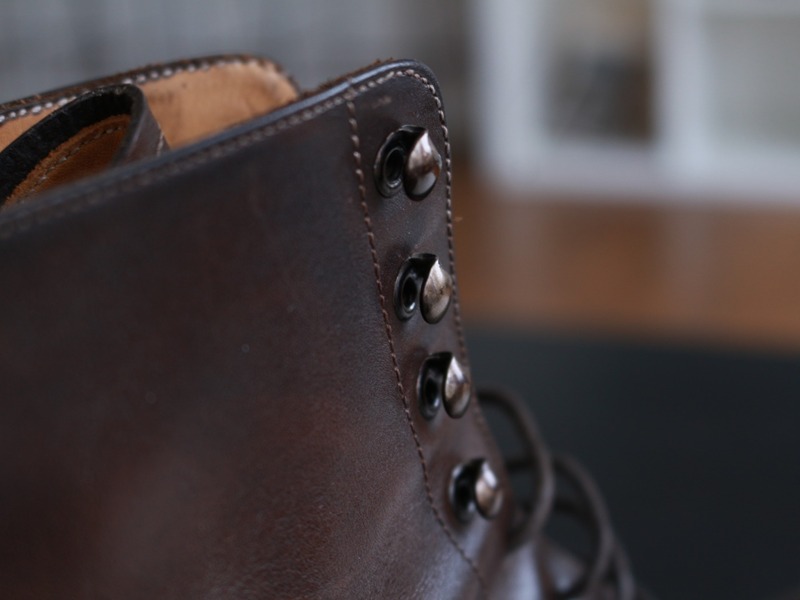 Shoes are no different, since you want to appreciate every little detail that goes into a pair of handmade craftsmanship. As I mentioned above, my initial thought was very positive. The boots have an unusually high shine just like my Monks and the Coimbra Patina looked great. I held the boot with one hand and it was surprisingly light but sturdy. The leather was smooth and the stitching was on point, apart from a tiny part of the welt. I will go into detail about this later. Here’s a picture I took just after opening the box to get the feeling of the original unboxing. 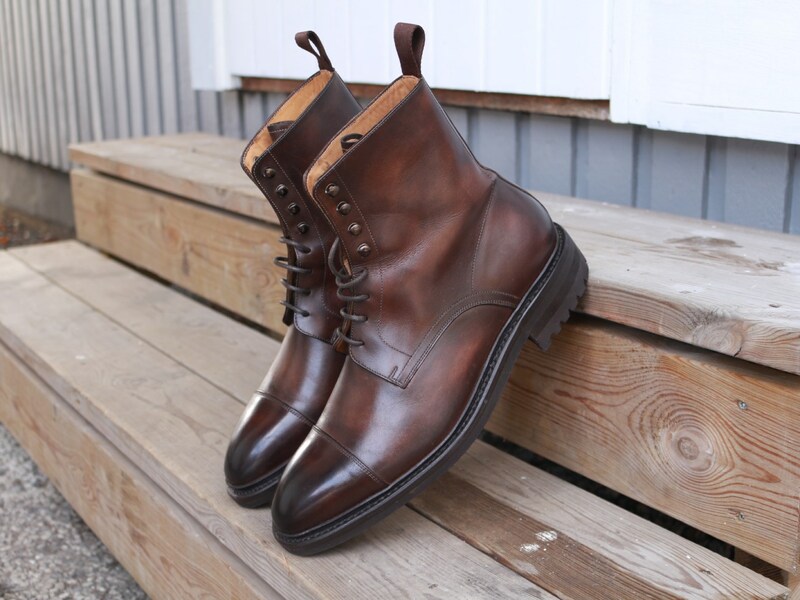 The Carlos Santos Lace-Up Boot is a Cap-Toe that resembles a derby shoe with a longer shaft. This means it has open lacing as opposed to the oxford (more information here) with 4 normal eyelets and 4 speed hooks on the top. The facing looks a bit like a hockey stick and is tied together by dark laces, which blend very well with the boot. 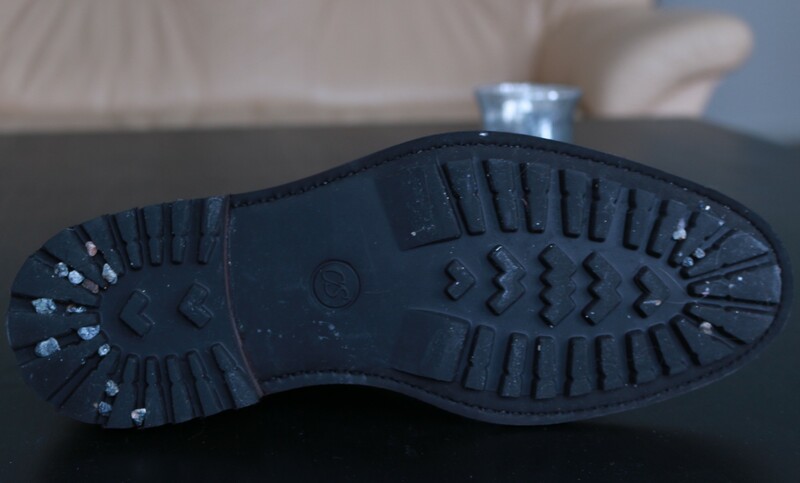 It is very common for boots to have rubber dainite soles, but this one has a commando sole. It is certainly less dressy and a bit bulkier, but I feel it is perfect for this one. The only negative with this is that during Winter in Sweden they spray little rocks on the pavements for traction and these get stuck in-between the spaces of the sole. The Patina is beautiful, although less “loud” than the Wine Shadow. However, upon closer inspection you can see the little differences that are really striking. 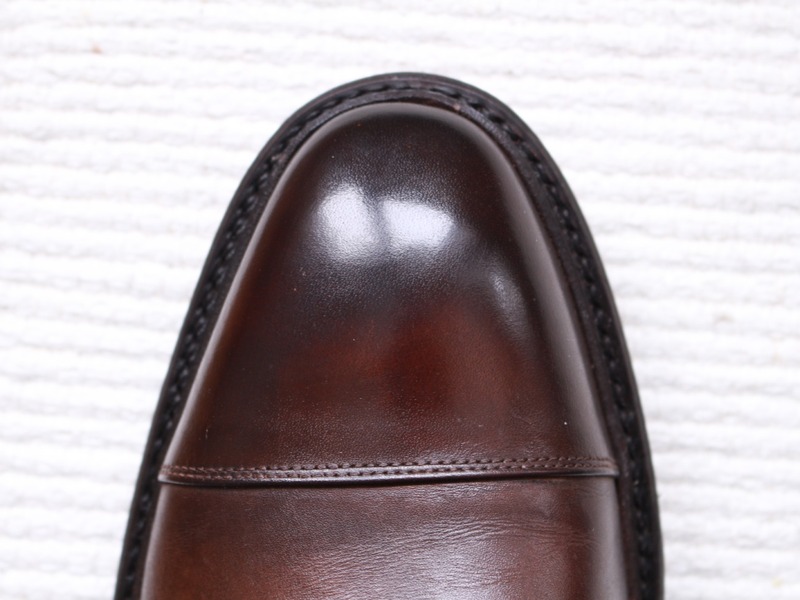 I especially love the burnished Cap-Toe, which is borderline black. This might not be an Edward Green Galway, but considering the price difference it looks just as good for me. Style wise, if I had to grade this based on my personal expectations and needs I would give it a 10/10. I can dress it up or down easily and the sole ensures I will not be tripping any time soon. 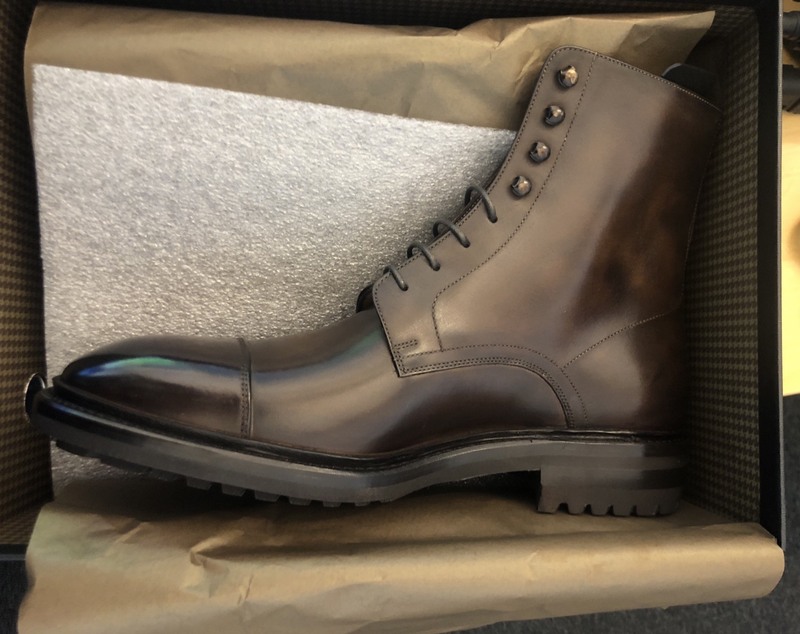 Remember however, that this is my opinion and for you the boot might look a little “plain” due to the absence of broguing or grain which seems to be popular these days. Pro Tip: There is a Field Boot that resembles the Galway very much and it is called Style 9156. The Carlos Santos 234 Last is one of the most common ones you will encounter and quite similar to the 401. It is a soft-chiselled last with a more narrow waist and fits well with the aesthetics of the boot. I decided to go with my regular size so I ordered a UK 7 (US 8/EU 40.5) which turned out to be the correct choice. I feel the 234 last is TTS (True To Size) with a more generous instep compared to the tighter 401 and with enough space for my toes. The boots fit snugly with just enough room to not be uncomfortable. To give you an idea here is a comparison of sizes of all my shoes. And for better visualization, here is a side by side view of all my shoes. You can notice the differences on the shapes and toes. The Loake 1880’s are classic while the Carlos Santos more daring. The 234 Last is also quite comfortable on the heel and seems to be more forgiving for someone with a bit wider feet. It is also the longest in length. There is a tiny little bit of gap above the ball/waist area but this is a RTW shoe so it is understandable. I tried them with both normal and thicker socks without a problem, although the fit was more snug with the latter (but definitely not uncomfortable). 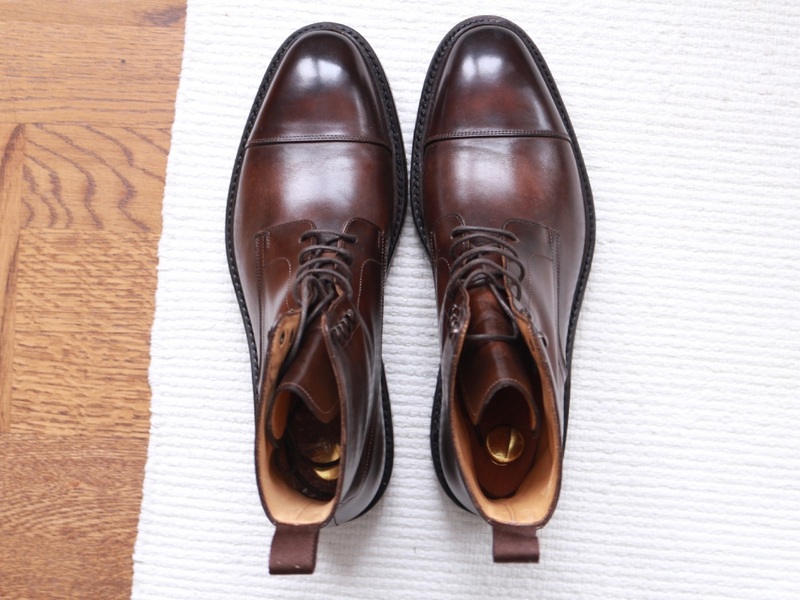 The leather feels smooth and less stiff than the Loake, leading to a quicker break-in period. I have worn these two times so far, both on work days and in a rougher environment. Snowy, mushy and slippery roads with a lot of tiny rocks but I did not feel anything. As for the fit, I mentioned above that the boots were comfortable right out of the box, which is great. After about 6 hours of wear I got a tiny bit of heel pain but it has disappeared now completely. The 401 Last on the other hand made my heel blister during the first 2-3 wears. So if you are looking for a more comfortable, roomy last the 234 is surely the way to go. These are my first Lace-Up boots believe it or not, so it was strange feeling the leather so high up my ankles. After a couple of hours I totally forgot about it and it should not bother you. Due to the open lacing, it is very easy to put them on or off with the help of an elastic loop you usually find on Chelsea Boots. If you are in a rush though, these are not the kind of shoes to wear! You have to loosen up the laces, tighten them up again and also tie the hooks properly. All in all, these are some of the most comfortable Dress Shoes I own and required the least amount of break-in period. It took me 5 months to break-in the Loake 1880 Chatsworth while this just 1 wear. I would give it a 9.5/10 but look out for future updates. These give me a fairly good idea of the overall quality. These Carlos Santos Lace-Up Boots were very consistent. The leather is soft and smooth, sourced from reputable french tanneries. There were no irregularities with the color but there are differences. Make no mistake though, this is painted by hand and it is part of the Patina. This also means that no other shoe will look exactly like yours. I was initially skeptical about the laces as they are thinner than the Loake, but they are actually quite robust. The eyelets are all punched in nicely and the hooks are sturdy. The loop on the back has a twill weave look and can take the punishment. 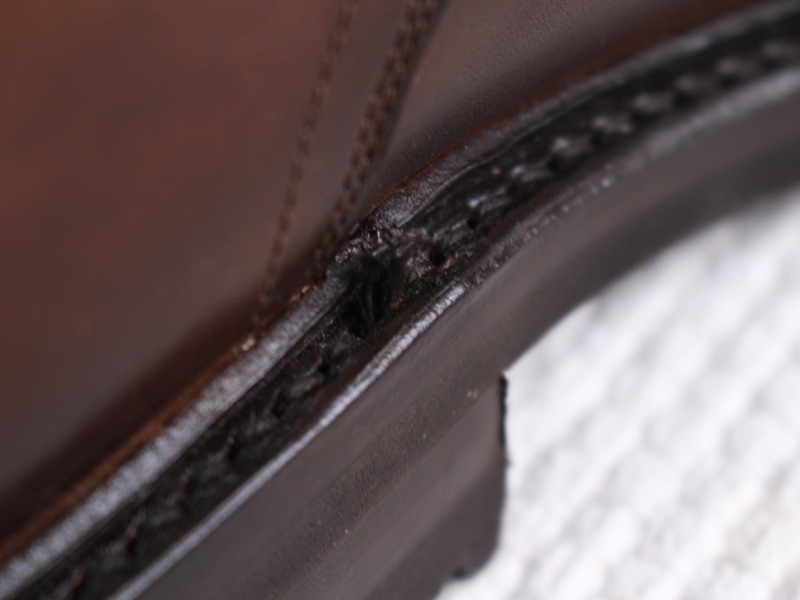 I could not find anything wrong with the stitching of the uppers or the Cap-Toe either, which leaves only one area: the Sole. The Sole is perfectly fine, but I really need to nitpick to find some flaws right? Some areas on the sides are a bit rugged and there is a part of the welt stitching that has some loose threads. Nothing that bothers me, especially given the price point. Bear in mind that if this was a pair of, say John Lobb I would be unhappy to find such blemishes. The Sole though is an absolute tank! Rocks don’t make a dent, you have much better traction in the snow with the Commando Sole. I am very happy with this, though the little stones that get stuck underneath can be annoying when you enter a building. Taking all of this into account, as well as the price a 9/10 is well worth it. 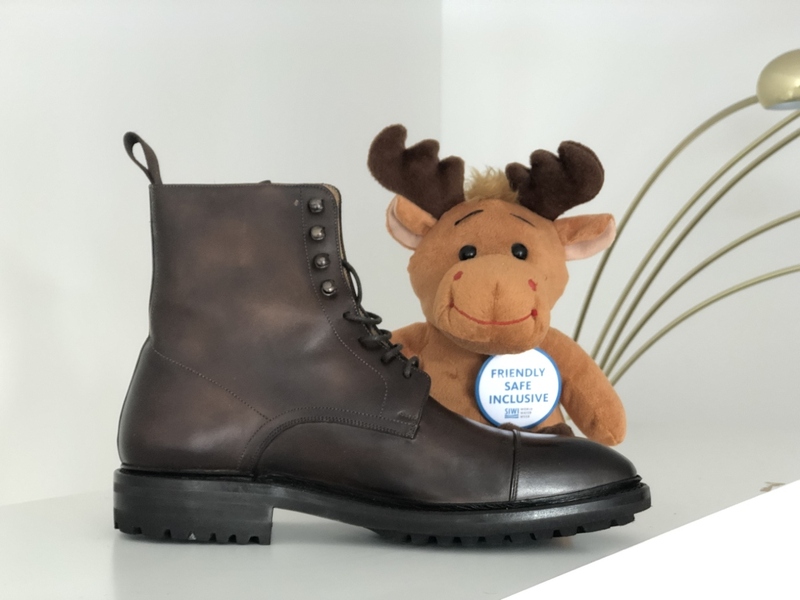 Carlos Santos Boots Review – What Is The Price? If you get one of these during sales, it is an amazing deal for the money. However, if you need a pair of good boots for every day wear (especially in colder climates) these are worth it even at full price. It is great to see that availability has increased but they are not so accessible in other continents. Most of the shops though will ship internationally so do not worry about that! Reminder: If you order through the Patina Service, you will have to wait from 2-5 weeks depending on the season for customization. This is a little bonus section I thought about while writing, since many are uncertain about how to style these. Let’s start with the basics. These are definitely less formal shoes, which means they will be great for wear with denim and chinos. Blue, beige, khaki, dark green and grey goes great. I used to think that boots don’t go well with suits or business casual outfits, but I have changed my mind after this. 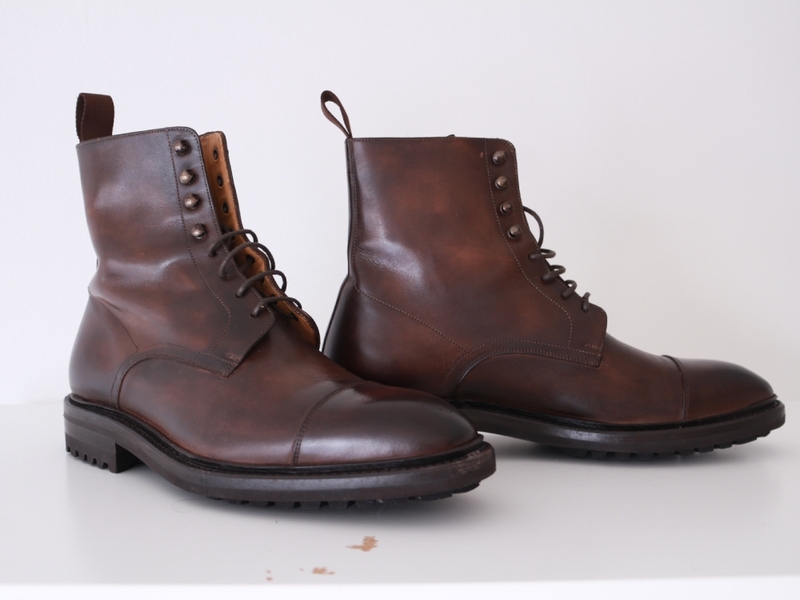 Derby boots and Balmoral Boots work the same as their normal variations. The shaft hides under the pants so it is almost impossible to tell the difference while not sitting. All the above colors work equally well and the dark brown color is very versatile but also a little more formal. Pro Tip: People always ask me how I condition & shine these boots. I use the saphir medaille d’or in neutral color and it works very well. Apart from minor blemishes here and there, I think my stance on the Carlos Santos Lace-Up Derby Boots is quite clear. It represents great value considering the price, quality and overall construction. As for the aesthetics, they are certainly pleasing and the pictures do not do them enough justice. They are even more striking in real life and you will receive a lot of compliments. Whether you are looking for a sturdy winter boot or a more dressy option for your suit, this is a very good option. Very comfortable to wear from the get go, with a nuclear sole that will last you for life with proper care. 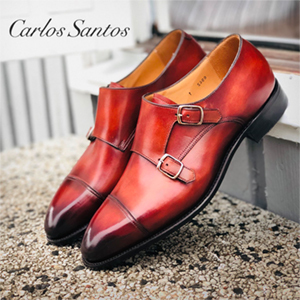 I am probably sounding biased, but I already own 4 pairs of Carlos Santos Shoes and a quick search around the web will show you that everybody else agrees. Extremely good quality for the money and one can feel the love that has gone in the making of each shoe. This brings us to the end of the “Carlos Santos Boots Review” and I hope you enjoyed the pictures and the analysis. I would also like to take the opportunity to thank Ana Santos for the incredibly friendly and helpful customer service. It just feels so personal which is fantastic. It is easy to see why they have such a good reputation around the world. 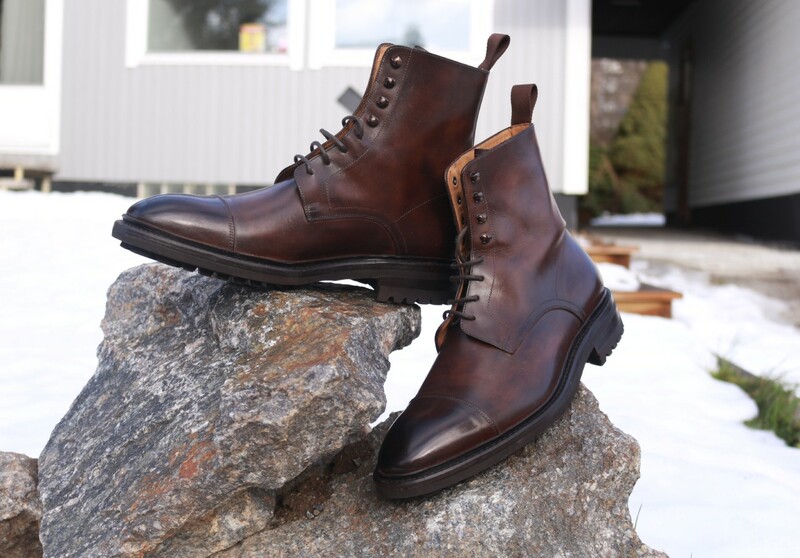 These boots could not come on any better time as it rains & snows heavily in Sweden. But I am very well prepared now right?! Times like these it makes me wonder how my readers tackle these harsh conditions. Why don’t you leave a comment down below and let me know? Are you too a proud owner of a Carlos Santos Boot? I will see you next week but until then, have a good one!